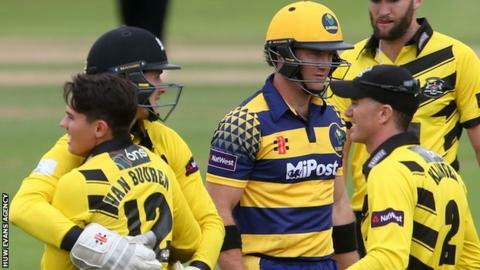 Glamorgan Cricket Club will be "really well-placed" to host a city-based team in a new T20 competition, according to chief executive Hugh Morris. He says the tournament is needed for financial and participation reasons. "The idea of using a new city-based team to help drive participation is really strong, and the potential to increase revenue into the club is very attractive," said Morris. The competition could start in 2018 if broadcast deals are agreed. All 18 counties would receive an extra £1.3m a year in funding, plus about £300,000-400,000 more for each of the host venues. "I think Glamorgan is going to be really well-placed to host one of the franchises," Morris told BBC Wales Sport after briefing county members on the plans. "We've experience of hosting big games, we've hosted two Ashes series, and I believe we've got a sporting nation that would get behind a city-based team." Cardiff may be in competition with Bristol as a venue, after Gloucestershire chief executive Will Brown declared: "Bristol has to be part of it... we have high hopes." Morris said: "We've got three million people throughout the whole of Wales. "We can capture the hearts and minds of those people and I believe we'd be well-placed to host of one of the teams." Two teams are likely to be based in London, two in the Midlands and two in the north of England, with Southampton a further international venue option. The plans have proved controversial among many cricket followers, but Morris highlights the game's finances and need to attract future generations. Just 2% of children named cricket as their favourite sport in an England and Wales Cricket Board (ECB) survey. Glamorgan wrote off nearly £10m worth of their debts thanks to 2015 agreements with Cardiff Council, Allied Irish Bank and ex-chairman Paul Russell. But Durham have been relegated for 2017 after needing an emergency ECB bail-out. "Our sympathy's with Durham, we found ourselves almost in their shoes," said Morris. "The game as a whole has between £120m and £150m worth of debt and we've got to do something about that." The proposed tournament is still being discussed by the counties, the ECB and potential broadcasters, including the BBC and rival satellite stations. It would involve three overseas players in each 14-man squad, with the rest allocated by a draft or auction system, according to Morris. But Glamorgan would continue playing T20 cricket elsewhere in the calendar. "A lot of big organisations have more than one product, and they brand them accordingly," he said. "They're marketed to different people."